Some critics go so far as to call Henry James the American writer. Examine ?Daisy Miller,? The Turn of the Screw, ?The Jolly Corner,? and other works by James. The text includes essays from some of the best James critics along with a chronology of the author?s life. The title, Henry James's Daisy Miller, The Turn of the Screw, and Other Tales, part of Chelsea House Publishers' Modern Critical Interpretations series, presents the most important 20th-century criticism on Henry James's Daisy Miller, The Turn of the Screw, and Other Tales through extracts of critical essays by well-known literary critics. 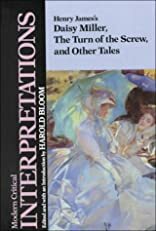 This collection of criticism also features a short biography on Henry James, a chronology of the author's life, and an introductory essay written by Harold Bloom, Sterling Professor of the Humanities, Yale University. About Henry James (Editor) : Henry James was a published author and an editor. Some of the published credits of Henry James include The Bostonians (Everyman's Library (Paper)), The Ambassadors, Partial Portraits.